Building muscular strength, stamina, and size is a feat that is easier said than done. Even with the best intentions in the world, many exercisers fail to achieve their desired level of muscularity. However, this isn’t an issue of dedication, will, or sheer determination. Rather, an issue of working out with an inferior weight training program. Generally, most weight training programs prove to be effective at producing results in the beginning, but shortly after the results come to a halting stop. Although you may continue to workout hard and consistently, you’ve reached a plateau and you’re no longer reaping the benefits of what you’re sowing. Why? The problem lies in the fact that most weight training programs lack or neglect key aspects necessary for muscular growth; periodization, exercise variety, and a recovery phase. Periodization is the process of structuring training into different phases. Studies have shown that nonlinear forms of periodization produce superior results over non-periodized programs1. If your workout routine doesn’t have a structured change in intensity and volume, then you aren’t maximizing the results of your training. If your workout routine includes the same exercises over and over, eventually it’s going to become stale both mentally and physically. Despite your best efforts, your training program will become repetitive and tedious. If the mental focus, enthusiasm, and intensity are missing during your workouts, don’t expect to effectively build muscle or get top notch results. Adding new and different exercises in your workout routine is an effective and momentous way to boast your mental drive and focus in the weight room. A recovery phase is a planned reduction in training volume, frequency, and intensity. This phase is one of the most overlooked aspects of weight training programs, but it is of great importance for exercisers who frequently train hard and intensely. If your body is unable to adequately recover from the volume and frequency of your weight training sessions, then you may mentally burnout, sustain an overuse injury, or in extreme cases you may even regress in strength. However, including a recovery phase in your workout routine will allow you to bounce back from your frequent intense workouts. This phase will help restore your mental concentration, help your joints and connective tissues stay healthy, and help you gain strength by giving your body a break from the constant wear, tear, and stress of frequent weight training sessions. 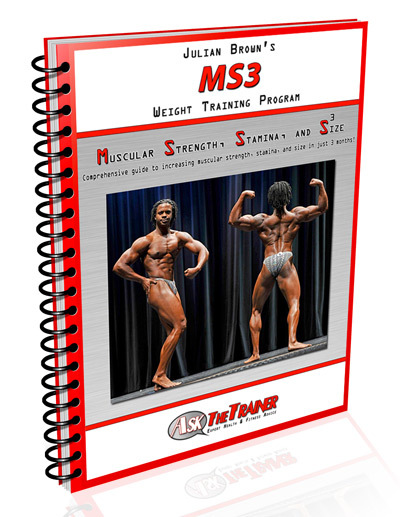 The MS3 Weight Training Program is my comprehensive guide to increasing muscular strength, stamina, and size. This superior weight training program utilizes nonlinear periodization, recovery phases, exercise variety, and manipulation of intra-workout rest periods in order to maximize the strength, size, and stamina aspects of muscularity. In just three months, the MS3 Program will give you noticeable differences in muscular strength, stamina, and size. The MS3 Program is available for a limited time only in the Askthetrainer Store, and it comes with a complimentary edition of Maximum Muscle. Stop using an inferior weight training program, and start using the MS3 Program which is designed for maximum muscularity.